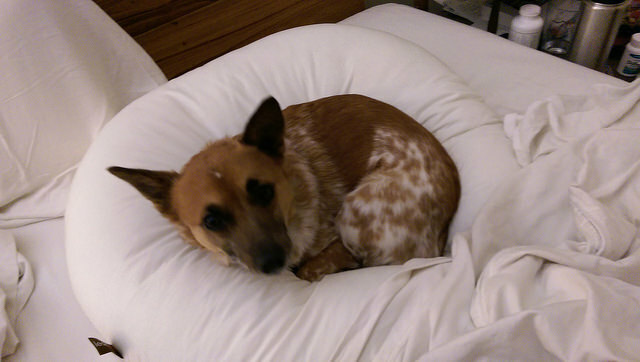 PoPville » Lost Dog Last Seen on the MBT by 9th St and Monroe St, NE; UPDATE – Found! “His name is Finnegan, and he just ran away at ~5:30PM Eastern time. He was last seen at 9th and Monroe St NE, in Washington, DC. He was running the Metro Branch Trail. He’s a mix of rat terrier and cattle dog. Photos of him are attached. Any sightings or information will be extremely helpful. * He’s likelier to come if you crouch down and beckon or whistle. Don’t run at him, and try to crouch and stay low if you get near him. * He responds to “Finnegan”, “Finn”, and whistles.